The Federal Minister for Industry, Innovation and Science Greg Hunt MP and Federal Member for Bennelong John Alexander OAM MP took time out of their busy schedules recently to visit the Australian Hearing Hub and the parts of the Macquarie Park Innovation District (MPID). The parliamentary members spoke to the Vice-Chancellor and other members of the University’s executive team and academic staff, as well as MPID members. The discussion was far ranging and focused on the importance of industry collaboration, recognising the unique role that MPID can play in connecting business, academia, students and the broader community. 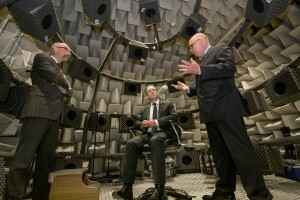 The anechoic chamber, located within Macquarie University’s Australian Hearing Hub, was one of the showcased highlights, with our guests being suitably impressed with its functionality after partaking in an auditory demonstration of the facilities. They were also interested in the innovative use of telepractice technologies by the Sydney Cochlear Implant Centre and the services offered at The Shepherd Centre. Ending with a roundtable discussion with members of the Macquarie Park Innovation District, the visit also generated interest in the media and resulted in coverage in the nationwide newspaper, The Australian.